How to wash a personalised T-shirt - best way to wash and preserve the print on personalised T-shirts. If you have ever created your own personalised T-Shirt you’ll know how much fun it can be coming up with designs, choosing the best way to transfer it to your T-Shirt and then of course wearing it so that you an broadcast your individuality and personality to all around you. However keeping custom made shirts clean is a little more work than your other laundry, so you need to be more careful when washing a T-Shirt with your personalised design. If you’ve added your design with fabric paints or inks the most important thing is to make sure you’ve set the design. After creating your shirt let the ink dry completely (this can take over 24 hours) and then place some grease proof paper over the design and iron it with a very hot iron. 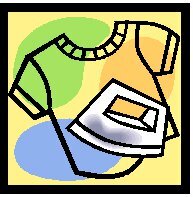 You should iron it for 3-5 minutes, but be sure to keep the iron moving so as not to burn the design or T-shirt. Do not use the steam setting of your iron. If you’ve bought an iron on transfer or even made your own using an inkjet printer you can help to protect your design by spraying it with a water repellent like Scotch Guard. Spray both the front of the design and the back by turning the T-shirt inside out. With both the above varieties of T-shirts, but particularly with iron on transfers it is safest to wash shirts separately from your regular laundry with a reduced amount of washing detergent, (approximately ¼ the normal recommended amount.) You can further protect your designs by washing the T-shirts inside out. If the T-shirts have picked up stains that won’t be removed without a more intensive washing procedure you should hand wash the shirt so that you can tackle the stain individually. Professional personalised T-Shirts companies that print designs on T-Shirts use special screen printing inks and heat presses to seal the designs, this means that they can be washed as you would a normal shop bought printed T-Shirt. If you want to create a personalised design with a long lasting image that is easy to maintain it might be worth looking into having a shirt professionally printed.